I read this article and found it very interesting, thought it might be something for you. The article is called Why Gujarat’s Urban Infrastructure Build Is As Real As It Appears and is located at https://archive.indiaspend.com/investigations/why-gujarats-urban-infrastructure-build-is-as-real-as-it-appears. Most visitors to Gujarat and particularly cities like Ahmedabad come back impressed with the sheer pace of change on-ground, particularly in infrastructure. The question many ask is: how much of this is real and how much apparent? IndiaSpend’s Prachi Salve uses the Rs 66,000 crore Jawaharlal Nehru National Urban Renewal Mission (JNNURM) spend & execution report as a primary proxy to assess Gujarat’s infrastructure build; and finds that Gujarat is clearly setting perhaps the fastest pace in urban infrastructure build, particularly compared to many other states and cities/towns. By way of background, the JNNURM was started 7 years ago in December 2005 and was conceptualised as a major central Governmental initiative to improve urban infrastructure. Gujarat, after Maharashtra (see earlier report), has the second highest number of sanctioned projects at 72 worth Rs 5,604 crore. Of these, 38 have been completed. Incidentally, most of the completed projects were approved in March-April 2006 and have taken roughly 18 – 24 months for completion. Interestingly, the sector wise break-up of projects in Gujarat does not follow the national pattern. Nationally, the highest numbers of projects are related to water supply followed by sewerage with 152 and 139 respectively (see Table at end). There could be many reasons for this, either that these needs and thus projects would have embarked upon earlier and concluded or are pending. But here is the first reason for the visibility and the impressions created upon visitors to cities like Ahmedabad. In Gujarat, roads, flyovers & road over bridges (ROBs) form the lion’s share of projects being executed; 21 out 72 projects. Moreover, the state has managed to complete the maximum number of projects (related to roads and flyovers as opposed to other kinds) with nearly 17 out of the 21. A good example is Ahmedabad’s Bus Rapid Transport System (BRTS) programme announced in 2005-06 with a total approved cost of Rs 87.6 crore. The central Government contributed Rs 30.6 crore and the state and the Ahmedabad Municipal Corporation (AMC) or the urban local body brought in Rs 13.1 crore and Rs 43.8 crore respectively. The project has taken 24 months to complete. The second phase of this project is supposed to be completed by September 2012. Now, let’s look at the city-wise breakdown. You can see how Ahmedabad, Surat and Vadodara are faring and at what pace. Remember that logistically, at least compared to states like Maharashtra which has 12 cities/towns with various projects running, Gujarat has fewer cities to focus on. Gujarat’s JNNURM projects are concentrated in just 5 main cities out of which 1 is ‘Grade A’ and the rest are `Grade B’. 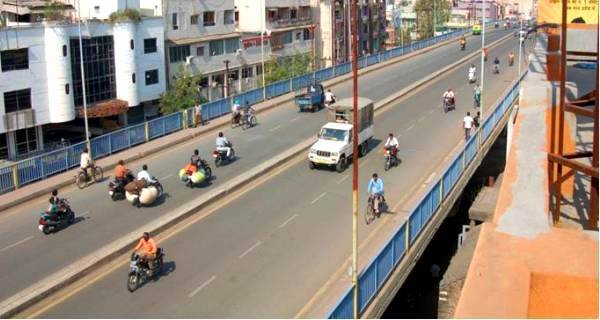 Ahmedabad is ahead of most of the other cities in Gujarat and has completed nearly 73% of its projects. Now, here is the second visible reason for Gujarat’s infrastructure build. Even without the JNNURM, Gujarat has been steadily increasing its urban spend both on the capital and revenue account. In 2012, the state spent a total of Rs 7,050.8 crore. This would include but also go beyond JNNURM-related contributions and spends. The figure includes central grants for schemes like the JNNURM but also includes the state government schemes like the Nirmal Gujarat, GUDA and the Hon. C.M. Swarnajayanti Programme for grants to urban local bodies or municipalities. The table shows Gujarat’s total expenditure on urban development. A lot of it is evidently coming from the revenue account of the government. Meanwhile the government spent (2011-12) nearly Rs 2,518 crore on rural development with Rs 1,594 crore as the state’s share and Rs 924 crore as the central share. Gujarat is seemingly moving faster because co-ordination between the state, the urban local bodies and the center is strong. Gujarat has also received (and used) a lot of technical assistance from the center. Other states may not have displayed the same alacrity, at least so far; whatever maybe the reason. But it’s clear that given the pace of project implementation, Gujarat’s urban citizens have more visible changes to look forward to in their immediate lifetimes than many other states. would like to receive such articles which speaks sense.